The student debt bubble is at its peek, consumers are purchasing more and more on credit, and everyone seems to think going 500k or more in debt for their “dream home” is worth it. The funny thing is that, if all or at least the majority of Americans followed a different thought process, this financial issue in the U.S. and globally would be very different. It all starts with what i call a freedom mindset. Have you ever looked around? Many of us seem to be wandering aimlessly around in life, waiting for something to happen to them. They are impacted heavily by their environment and only react from external motivations. They see commercials on television of kids wearing the coolest new clothes, their cool vacation spots, their in-style cars. Their emotion pushes them towards purchasing material items, when in reality they cannot afford them. We see this process for many material items in life that society tells us we must have. College is a big one, marriage is another one, and a home is a HUGE one. What do you think of when you think of freedom? I think of the ability to spend your time however you want, and in that sense, if you are not financially free, then you are not free at all. It is interesting though, you will see many people that make a lot of money (high income jobs) but in truth have no freedom, because they must keep those jobs to maintain their lifestyles. (I see this personally everyday). These people live without a freedom mentality because their focus is not freedom. Who knows what their focus is, but in my opinion they need a mentality shift. The focus of our lives should be creation and innovation, and freedom. If we have any ambition then we will strive to add a great deal of value to the world, in our own way based on our passions, and if we can do that, then we will eventually become financially free, its virtually a guarantee. Its virtually a guarantee. Similarly, if we simply focus on keeping our “high paying jobs”, we will almost be guaranteed a lack of financial freedom, or at least not before we are nice and old. So, the lesson is to change your mentality, now. As mentioned, debt is a lack of freedom. If you are in debt, you are constantly in need of income to pay off your creditors, which is not something you should accept as normal. I think that is the problem for many of us. We convince ourselves the debt is okay, because its for things that we “have to do or have”. I was guilty of this as well, and learned a huge life lesson. I went thousands of dollars into debt for college (lucky I thought about the returns and have paid it off), however I assumed “oh its college its fine to go into debt for that, but, the truth is that this decision should be thought about in detail first. 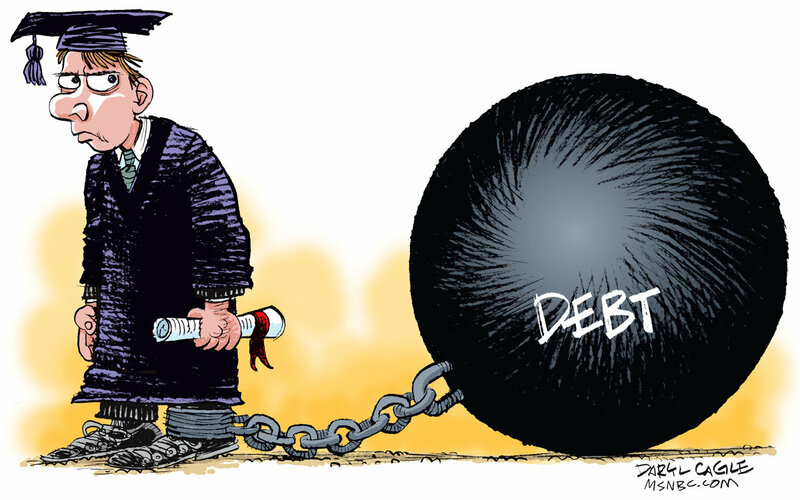 Is the college likely to pay off your debt quickly? Can you pay off your mortgage in cash if you need to? Can you afford to drop $100,000 on your marriage? If you will go broke from it, don’t do it. The main point; debt will cripple your appetite for risk and limit your happiness to an extent, so tread carefully. In the end, do not stress too hard if you have taken on debt, see it as an incredible piece of luck that you have found this article, and now know the correct mentality to have, its a quick fix because you’re entire state of mind will now change and you will seek freedom until you have it. Go to work and get your freedom!